The readings at Mass are rarely sung. It's a pity because singing the readings lends and incredible dignity to the text (and the English in the OF needs that!). Well, perhaps it is time to think about this. Truly, it is a marvelous thing to hear. But how is it done? The old Liber Usualis contains 14 pages that are a model of clarity. These pages explain the tones and how they work for each reading (Prophecy, Epistle, Gospel) and provide various choices. The explanation is as lucid as I've seen. There is a bit of a learning curve, but with this guide, it does seem that anyone who can manage to navigate a few pitches could do it. Here is the excerpt from LU, which will be used at the Celebrant Seminar in a few weeks. Today we had a special blessing at Mater Ecclesiae. Fr. Benedict Groeschel, C.F.R. visited us and delivered the homily. As might be expected, Fr. Groeschel brought his usual candor and wit to his delivery. In the context of today's Gospel (healing the paralytic), he discussed the advent of the historical-critical method of Biblical interpretation. He asked the congregation whether they'd ever been told in church that Jesus did not perform any miracles. When only a small number raised their hands, he said, "Oh yes you were, you were just asleep." :) Father went on to recommend Pope Benedict's new book, Jesus of Nazareth, which gets out the guns in defense of Christianity against the modernism that fuels the historical-critical method. He also mentioned a fellow named Albert Einstein, who, though a Jew, wanted nothing to do with the rationalist take on Jesus. Fr. Benedict spoke highly of the liturgical apostolate at Mater Ecclesiae, and he also spoke hopefully about the motu proprio Summorum Pontificum. He in addition pointed out that Mater Ecclesiae, having a wonderful community steeped in tradition in every way, also has a lot of responsibility. I think this statement has wide implications for all of us. Anyone who has a gift also has a responsibility. After Mass, the procession went outside to unveil and bless the new memorial to the unborn. Our rector, Fr. Pasley, read the Gospel story of the Holy Innocents and read the De profundis. It was a moving sight to see Fr. Groeschel, sitting slightly off to the side, reciting this great Psalm from memory. I suspect that he has lived the meaning of these words, having been arrested once for protesting at an abortion mill. It is worth noting that Mater Ecclesiae has an active and strong pro-life apostolate. It is one of the ways that this parish takes part in the life of the Church at large. The blessing of this monument was timely, as only this past week an abortion clinic in nearby Atlantic City, NJ was shut down. Finally, everyone retired to the parish hall for one of Mater Ecclesiae's signature receptions. I shall say it again: I have never been part of any other parish that has such lively fellowship after Mass. I left at 3pm, and there were signs that the party might well have continued until dinner. I've recently become fascinated by the growth of "Meet ups" as an alternative form of civic organizing. So in an effort to promote our Monday night chant sessions, we've changed them into a meetup. As it is, we seem to have the only Gregorian Chant meet up in the country! The Auburn Gregorian chant Meetup! We've spoken of this on the NLM before, but Fr. Zuhlsdorf picked upon on this little tidbit from the Italian media which furthers the speculation: Benedict’s Pontifical Mass in St. Peter’s? Maybe 2 December. CITTÀ DEL VATICANO – A new direction for culture and rites in the Vatican: Yesterday the Pope nominated Giovanni Maria Vian director of L’Osservatore Romano and consecrated as bishop the Milanese priset Gianfranco Ravasi who will have the role of "minister of culture"; in the next few days there is awaited the nomination of the new "master of ceremonies" to replace Archbishop Piero Marini. After the arrival of the new master of ceremonies it is "probable" that the Pope will celebrate a Mass with the old rite, in St. Peter’s, obviously entirely in Latin: it could happen in 2 December, the first Sunday of Advent. Nothing precise is known about the Pope’s intention to give bishops an "example" of his own choice to use the older rite, byeond the reception of requests of the faithful, as the Motu Proprio he published in July provides. The rumor is circulating both on the lips of those who hope in such a gesture, which says that he would definitively clear "through customs" the old Missal which is still encountering resistance in spite of the recent derestriction; and also among those who fear that the Pope is making the gesture because it would be "another step away from the Council". "Right now it’s only a rumor", says a monsignor who is neither for or against it, "but everyone is talking about it around here and I believe he is going to do it even if he risks stirring up some polemics, because Catholics who are less than 50 years old have never seen a Pope celebrate Mass with his back to the people and speaking the ‘Eucharistic Prayer’ in a low voice." In the meantime, the ‘court’ which accompanied the Pope in these celebrations was abolished and I really want to see how an old papal Mass would be carried out today!" One of our readers pointed me to Catholic Church Conservation who have a unique little story, Pope's brother attends Latin Mass in Regensburg, complete with photographs. The Mass took place in the Church of St. John in Regensburg, and was celebrated by one Fr. Walter Lang of Munich. The Twin Cities Catholic Chorale of St. Agnes of St. Paul, Minnesota, has produced a lovely 80-page book of remembrance for Msgr. Schuler. You can view the book here or order it here. The new issue of Today’s Liturgy (OCP) features a piece designed to give the thumbs up to every manner of percussion in Mass. The piece is called “Sacred Drum,” and it’s by John Pennington of Fort Lewis College in Durango, Colorado. The piece largely consists of questions from the Psalms, Samuel, Exodus, Chronicles, and I won’t quote all this here since concordances are readily at hand. The upshot is that we should praise God with cymbals, tambourines, and other things that clang and bang. Now, it’s one thing to have tympani to go with a classical piece or drums in a procession. And I can even imagine Verdi’s Requiem in liturgy and all its banging. But somehow I don’t think this is what is at issue here. I suspect he is talking about the run-of-the-mill trap sets that you find in jazz and rock bands, so the issue becomes a matter of radical departure from the Roman Rite tradition. Beyond that, I’m not sure what to say about his argument. It seems wrong, but why? And what about the relevance of the Bible passages he quotes? Motu Proprio? Great! But where does that leave the Reform of the Reform? Recently a commenter here noted that much of the news and activity these days is about the classical Roman liturgy -- including on the NLM and other sites. In that vein, they wondered whether the reform of the reform was still important generally. They tied into a piece in the New Oxford Review which has (erroneously I believe) suggested that the Reform of the Reform "is going nowhere". This question was asked in earnest by one who supports the goals of the reform of the reform. It is an interesting question that I think merits some consideration. The initial part of an answer is that, evidently with the motu proprio only 2 weeks old, it is only natural that there should be a variety of events surrounding that which will understandably dominate our focus and attention. As well, we must stop and realize just how significant Summorum Pontificum really is in the life of the Church generally, and as relates to genuine renewal and restoration of the liturgy specifically. This is something that demands some focus, deep consideration and analysis -- and such it has indeed generated, bringing the liturgical question right to the very fore. The motu proprio really has changed the playing field, and concurrently it has also changed some of our old categories and ways of thinking -- or it needs to I would propose. I believe we now, more than ever, need to move beyond thinking that is in terms of the reform of the reform or classical liturgy being distinct and separate camps and initiatives -- and never the twain shall meet (as the saying goes). They represent two forms of the Roman liturgy that operate within close proximity now, both of which enjoy the associated rights and privileges that go with that. This does not of course devalue the proposed need for a deeper reform of the reform itself ("Phase 2" as it has been referred to here) and the project of post-conciliar liturgical study and critique as pursued by the likes of Fr. U.M. Lang, Fr. Jonathan Robinson, Dr. Alcuin Reid or Dr. Lauren Pristas to name only a few; it intends only to speak of the two sets of Roman liturgical books. Moreover, I think we need to understand that the motu proprio and its implementation is not just about the classical liturgy. It is indeed about that, but it is also very much about the reform of the reform as well. The Pope referenced this in his document. In many regards, I believe the reform of the reform and the classical liturgy are now much more fundamentally tied together than ever before given that it (the classical liturgy) can now operate more freely (and thus also more likely) in a typical parish context -- the same place where the reform of the reform occurs. In fact, I will go a little further out on a limb to suggest that I now personally believe that the reform of the reform is particularly driven by Summorum Pontificum and the wider implementation of the classical liturgy in parishes, seminaries, monasteries and so on. This is not to devalue one or the other, but it is simply to suggest a co-relation -- and one that is both natural and desireable. Consider that the reform of the reform has the (difficult) path of pursuing liturgical reforms (where it can on its own authority, for the deeper reforms are the perogative of the Church itself) in a larger pastoral context that requires greater patience and prudence. Pastors of such parishes must pursue their reforms carefully and the diocesan climate is often such that further hinders them in this precisely because liturgical rupture has been the dominant voice and expression for so long. In contradiction with this, however, it would seem that any reform of the reform best makes sense in relation to the preceding liturgical tradition. Evidently it would be a pastoral disaster (again) to simply go back to the point where we left off and try the liturgical reform again as intellectually sensible as that may be. This presents something of a conundrum -- until Summorum Pontificum that is. Summorum Pontificum has the power to keep as a living reality the ancient Roman liturgical tradition as it developed down the ages. One of the strokes of brilliance found in the consequences of that document is that precisely because it helps preserve the preceding liturgical tradition in present-day parish and priestly life, it can also help bring forth the priestly and pastoral familiarity and formation with the liturgical tradition that is necessary to help propel the reform of the reform ahead as well -- and in direct relation to the organically-received tradition itself. In that sense, it is radical enough to jolt us out of a liturgical rut while being delicate enough to not upset the proverbial parish apple cart. As such, for those folks who are focused more directly in their efforts upon the reform of the reform, upon seeing and hearing more about the classical liturgical tradition in the news, in the local parish and otherwise, be aware that such helps everyone liturgically by sheer familiarity and "mainstreaming" of our liturgical tradition and is, by consequence, very much about both the reform of the reform and classical movement. Indeed, both continue have a place and an importance, and indeed, both will continue to be reported upon and supported here as I am sure they will elsewhere. It's not an either-or, it's not about volume of information on one or the other, and it's not even any longer just about co-existence. It is about their co-relation and how they can mutually help propel us forward to continuity and fitting, proper and solemn worship. Thanks to one of our continental readers for this tip from the il Giornale blog: Habemus Praefectum cerimoniarum Summi Pontificis. Approximately one month ago the NLM had a photo of the Fraternity of Christ the Priest and Holy Mary the Queen. The blog Creer en Mexico had an interview with the head of this new group which one of our readers translated. On various catholic internet sites... pictures have been displayed [of this Fraternity] and received with a certain surprise by the readers of English, French and Spanish language, since up to that moment the Fraternity had remained unknown. 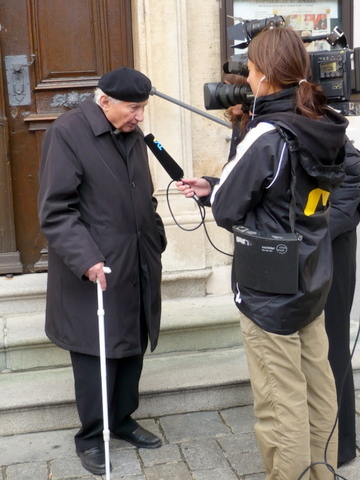 On the occasion of these communications we asked the founder of this new institute, Fr. Manuel Folgar Otero, to tell us a bit more about the history, the charism and the mission of this Fraternity located in Pontevedra, Spain. Creer en México (CM): Information about the Fraternity is beginning to be known in various circles of faithful adhering to the liturgy of John XXIII, but it really is not known how very new the Fraternity you head is. Could you sum up its history for us? What is its current status? Fr. Manuel Folgar (FMF): The Fraternity didn't start as something planned. In the beginning, in 1990, it was a parish prayer group, and from there it has developed until today. We did nothing but listen to God and answer to what we considered to be His will at every step. Nothing would have been possible without absolute confidence in the Most Blessed Virgin. It is always she who brings us to Jesus and who gives us the strength to do what He tells us. The Fraternity is of Our Lady, to her it belongs. The status, since 1999, is that of a private association of faithful of diocesan right. CM: We are informed that this month of October, you will present yourself before the Commission Ecclesia Dei. What is the objective of this meeting? FMF: The date has not yet been confirmed, but the objective is none other than to represent to the Holy See our desire to be added to the congregations or associations which are directly dependent from Ecclesia Dei. One Brother has finished his studies of preparation for the priesthood and another one is in his last year. Of course our wish is that they receive Holy Orders according to the extraordinary rite. We put ourselves in the hands of the Apostolic See in order for it to provide and dispose in what manner everything shall come to pass. We also offer our readiness in order to be able to accommodate the requests of groups and individuals who desire the liturgy according to the books of 1962 and who don't have priests who take care of them. Ultimately, we want to live and work completely at the disposal of the Holy See. CM: Why the interest of the Fraternity to use exclusively the former liturgy? FMF: This is an important nuance: we do not aspire to use exclusively the Liturgy according to the books of 1962. What we want is that the traditional rite be the official rite of the Fraternity, in such a way that the candidates for the priesthood receive Holy Orders according to said rite and that in the chapels and oratories of the Fraternity this rite is always celebrated. However, we don't refuse to celebrate according to the Novus Ordo if the diocesan Bishop needs our pastoral service for a parish of the diocese. 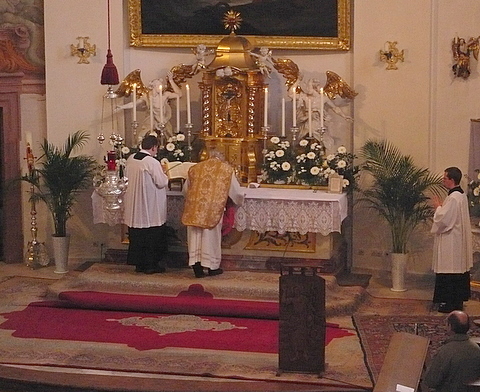 We believe firmly with His Holiness, Benedict XVI, that the two forms of usage of the Roman Rite can be mutually enriching, and that "the total exclusion of the new rite would not in fact be consistent with the recognition of its value and holiness" (Accompanying letter of the Pope to Summorum Pontificum). CM: The Fraternity consists of 4 groups: laypeople, sisters, brothers, and diocesan priests. In total, how many people do currently compose the Fraternity? FMF: The Fraternity is still a very small plant in the great garden of the Church. We members all are convinced that there is nothing great in the Church that in its beginnings hadn't been small. It is a permanent temptation to value the realities of the Church according to the number of members. To succumb to this temptation would mean to become mundane and to measure the strength and apostolic efficacy by the numbers instead of by the quality of the dedication and the seriousness of the commitments. When I am asked for the numbers I always answer that we who are, are it really and with all consequences, and we are ready to open our house and our heart so that all may come who really want to serve God, the most Blessed Virgin, and the Church. CM: For the lay members there is an increasing order of relations, from affiliated members to militant members. Is this last degree a kind of Third Order? FMF: We could basically say so, yes. In this case it is only a question of terminology. The militant members commit themselves freely to live the spirituality of the Fraternity, which is fundamentally based on the Holy Sacrifice of the Mass, the childlike trust in the most Blessed Virgin, and the communion with the Vicar of Christ. The Militants form local fraternities and their organization is very simple. They meet weekly in the so-called cenacle, where they pray, receive formation and plan their apsotolic activities. It is, above all, about their having a solid and robust Christian formation, and being effective instruments at the service of the most Blessed Virgin to extend the Kingdom of Christ. Their first field of apostolate is their own family. CM: The order of the (Sisters) Missionaries of the Fraternity has a charism partly contemplative, partly apostolic. Are all your vocations from Spain? FMF: The life of the Missionaries has as its central axis Holy Mass, the praise of God and Eucharistic adoration. It is from here that they are able to develop a fruitful apostolate. Their priories are called to be true focal points of spirituality. The Sisters are Spanish and we ask God that he may bless them and let them grow with new vocations not only from Spain, but hopefully also from the Latin American brother countries! One year ago, the Mother co-foundress was called to the House of the Father at the age of fourty. She had offered up herself to the Lord as a sacrifice for the holiness of the priests. The good God willed to accept her offering. At this moment the Sisters direct a small House of spirituality at the Priory itself. Also within the Priory, they have a religious library which is sought out by priests and lay people. They make liturgical vestments and hosts for Holy Mass and they collaborate in three country parishes. We greatly need new vocations. Their apostolate of prayer and of presence is of vital importance. CM: The Sons Servants of Holy Mary Queen are the male branch of brothers and priests. Is the formation for the priestly vocations imparted within the Fraternity itself? FMF: So far the Brothers have attended the Theological Institute in the diocese. Obviously, this formation has been complemented in the Community, aiming for them to know well the doctrine of the Church, the Magisterium, the theology of St. Thomas and the classics of Catholic spirituality. CM: In addition to the former, the Fraternity has a place for diocesan priests. 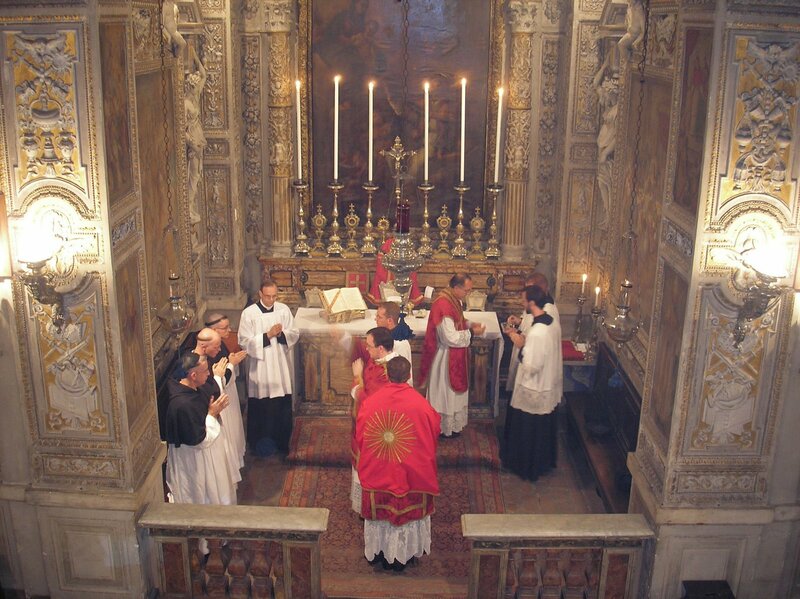 Do these priests have to know or learn to celebrate the extraordinary form of the Roman Rite? FMF: Doubtless that is a necessary requisite. It would be inconsistent with the very being of the Fraternity to scorn such a treasure. CM: Does the Fraternity intend to extend its mission to other places in Spain or to other countries? FMF: One of the causes of the slowness in growing is the small number of members and their youth. The Brothers have had to dedicate themselves to their studies, and could therefore not dedicate themselves to an active apostolate. To this is added that have been living in rural area with few inhabitants, which means few youth, in the extreme West of Spain, which is not chraracterized by the easiness of communication with the rest of Spain, above all because of the distances. This can change with the first ordinations. Our gaze and our heart are not only fixed on Spain but on all Latin America. I am of those who believe that the Lord not only calls individuals, but also peoples and nations. The "hispanidad" [hispanic world] has much to contribute not only to the Church, but also to the world. There is an incomparable spiritual heritage which we mustn't squander. God will call us to account for it! Regarding the issue of the Motu Proprio I reject that this treasure, which could bring so much good to the souls, should not be exploited by all of us. CM: Generally, how have the faithful of your area of apostolate received the traditional Missal and liturgy? FMF: From the beginning we chose to follow the rhythm the the Church herself has marked. We were certain that this step would be taken some day, and that is what happened. To our mind, nothing must be imposed, and not even anything done in a rush. People themselves must discover that riches of which Benedict XVI speaks. Neither is this only about an aesthetic taste or a pure outwardness. It is necessary to educate oneself and discover the liturgical treasure of the Church, to discover the profound reasons for which the Church, always assisted by the Holy Ghost, has codified these gestures, words, prayers ... all this marvelous monument which is the sacred Catholic liturgy. This is not some fashion. This is not about doing something in order not to do what the majority does. No. It is essential that the faithful understand the true reasons and that demands to guide them spiritually, to educate them and to accompany them. We must begin by becoming like children and rediscover the value of silence, the necessity of adoration, the interior participation and not mere outwardness... All this we have been doing for years, and therefore the faithful who affiliate themselves with us love and esteem the Traditional Liturgy. CM: Is there some final comment you would like to bestow on us? FMF: Thanks for that "bestow"... The real gift is that you allow me to share with you these reflections. Only one thing. The true participation in the life of the Church and more specifically in the liturgical life of the Church, does not consist in doing things. It consists, above all, in offering oneself up with Christ to the Father. To make of the whole life an act of offering to the glory of God, uniting oneself to Christ the Priest who immolates Himself on our Altars. After all, it is on the altar where our Christian being is born and also where it culminates. It is on the Cross of our Lord Jesus Christ where we can find all to which we are called by God. Through the Cross to the light! Last evening, I read the following piece on Zenit: Liturgical Dispute. It was surprisingly blunt from Zenit's usual style. The piece discusses the approach of some in the Italian bishop's conference, and also those who have tried to mitigate that influence. It is well worth reading. The FSSP now have photos up of their Pilgrimage to Notre-Dame du Cap in Québec, which took place earlier this month from September 1-3. A few select photos and a commentary to follow the photos. It is encouraging to me, as a Catholic within Canada, to see these sorts of youthful and traditional events taking place within Quebec specifically -- along with Cardinal Oullet himself and introduction of the FSSP into a Quebec City parish. Some might wonder why this would be of particular interest to me. One must understand that Quebec was formerly staunchly Catholic and then underwent a "quiet revolution" in the 1960's where anti-clericalism, secularism and liberalism reigned -- something still very much in effect today from all accounts. As such, as someone wittingly remarked, Mark Twain's sentiment upon visiting the city of Montreal in 1881 that "[t]his is the first time I was ever in a city where you couldn't throw a brick without breaking a church window" (speaking of the multitudes of Catholic churches in the city) could be appended in our day to further state that one, however, couldn't throw a brick and hit a practicing Catholic. As such, while not overstating the case (it is after all but one pilgrimage, one parish and one Cardinal), and despite what some in Quebec have recently said in response to the Motu Proprio this is certainly a "green shoot" of life, and a youthful one at that. One is hopeful that this youthful exuberance will be contagious and bring about a revival of Catholic orthodoxy and orthopraxis. Of course, one might point to the article linked to above in The Montreal Gazette and suggest the contrary. There is little doubt that many wouldn't be interested, particularly given the context of the past 40 years within Quebec (in which I also would raise the matter of language issues and the preservation of the French language within Quebec), but two points are worth noting. One is that reception of the Motu Proprio within Canada has been one of a deafening silence. Unlike their confreres in other parts of the world, most Canadian bishops and dioceses seem to have fallen silent on the topic of the motu proprio -- my own diocese has mentioned nary a word. As such, one wonders how well and truly interest can be gauged? Second, that being said the divide between continuity and rupture is a real divide, and so there will be some whom will persist in a rejection of tradition (as opposed to a simple preference with an otherwise open attitude). But what is encouraging is that openness, and not simply openness but also active interest, can be seen in the young faithful and families we see here. Therein lay great hope and what might be the first infancy of a Catholic Revival in Quebec. Let us pray for the intercession of Notre Dam du Cap that it might be so. Coming up next weekend, museums, historic sites, old theaters and churches throughout the five boroughs will be throwing open their doors to tourists in the know, free of charge, for tours, sightseeing and access to architectural sites usually closed. I went last year ("Episcopalian Real Estate Envy Tour 2006") and enjoyed stops at the Museum of the City of New York, St. John the Divine, the Fabbri-Vanderbilt Mansion and the (Episcopalian) General Theological Seminary, Chelsea, where the, er, girl seminarian (cough) who led the tour told us all about the pranks they play on their professors in chapel, as well as several labored Harry Potter analogies to describe the architecture of the place, which resembles a Cambridge quad translated to Manhattan. I have a feeling the parties are better at the North American College. The possibly doomed St. Vincent de Paul Catholic Church in the low 20s, a splendid example of continental Greek Revival architecture built for the local French community in 1857. Check out the interior while you still can. The Little Church Around the Corner, a tiny Episcopalian parish nestled amid the high-rises of Murray Hill, well-known for servicing the spiritual needs of actors. Temple Emanu-El, the world's largest synagogue, a massive (and sometimes rather overpowering) Moorish-Romanesque-Deco structure on Fifth Avenue that I am quite fond of, despite being described by a friend of mine as looking like a "Celtic mausoleum." Our Lady of the Scapular and St. Stephen's, a hybrid Catholic parish featuring a monumental east wall painting by Constantino Brumidi, the artist who brought you the Stations of the Cross at Notre Dame and the mildly ridiculous "Washington in Heaven" dome painting in the U.S. Capitol. The St. George Theater, on Staten Island; not very ecclesiastical, but no doubt much of the Italo-Spanish Baroque detailing for this 1929 landmark was borrowed from churches across the Mediterranean. These, and much, much more can be found here. Enjoy! • Why the Motu Proprio? • What is the difference between the Novus Ordo Mass and the Traditional Mass? • How can I benefit from a Mass said in a language I do not understand? There will be a Solemn Mass this Sunday, September 30th, at Sacred Heart Church, New Haven, Connecticut, with special music that has rarely been heard since the death of Palestrina: his Missa Sacerdos et Pontifex for SATTB choir, motets by the same composer, as well as allthe proper Gregorian chants for Michaelmas. 14th) ought to be marked not only by liturgical splendor but also with feasting and good fun! Please plan to come to this glorious Mass, bring your family and a few good friends as well, and be sure tojoin us afterwards for what promises to be a memorable celebration. Go here to vote for what you think the older form of Mass should be called. I'm writing after a long hiatus to give you finally news about the situation in Milan after the Motu Proprio "Summorum Pontificum". The situation in the Archdiocese is the worst one can imagine. At the end of August, the Diocesan Congregation for the Ambrosian Rite, under the precidency of the pro-president Msgr. Luigi Manganini - a well known hater of the Traditional Ambrosian Rite - decided that the Motu Proprio wouldn't apply to the Ambrosian Rite. This decision was taken without any previous consultation with the Roman authority. In a meeting with the deans of the Archdiocese, the omnipotent Vicar for the Evangelization, i.e. the same Msgr. Manganini, formally stated that the celebration of the Holy Sacrifice and of all Sacraments according to the old liturgical books was still completey forbidden, with no exception but the only small chapel of San Rocco, where it is still allowed, only ad experimentum since 1985, untill it will be decided to suppress it, because it is considered irrelevant and decandent. Manganini stated that -after 22 years of Mass!- the congregation who gathers there isn't to be considered a "coetus", mentioned in the Motu Proprio. The President of the Pontifical Commission "Ecclesia Dei" was informed in person of everything, and has shown great concern over the matter. Also Sandro Magister has recently mentioned this matter on his blog: "Settimo Cielo", announcing that a document may be issued shortly in order to extend the Motu Proprio also to the Ambrosian Rite. I hope to be able to give you futher news very soon. Via Le Forum Catholique and the website of the French diocese of Frejus-Toulon come some photos of the ordination of Jean-Raphaël Dubrule (to the priesthood) and Eloi Gillet (to the subdiaconate) in the cathedral of Toulon by Msgr. Domenica Rey on Sept. 22nd. Both men belong to a newly recognized community,the Missionary Society of Divine Mercy, which is entrusted with a personal parish in Toulon, the parish of Saint-François de Paule. A very excellent book which all the readers here should consider is David Berger's Thomas Aquinas and the Liturgy, published by Sapientia Press. Among other interesting details, Berger discusses what St. Thomas had to say about all those Signs of the Cross found in the Traditional Mass. Berger sets the stage by mentioning that when the Fathers of the Second Vatican Council inquired as to what was meant by the removal of needless repetitions in the liturgy (mentioned in Sacrosanctum Concilium), they were told that this meant the many Signs of the Cross in the Canon. Apparently this was a satisfactory answer. Pope Innocent III--who himself effected a reform of the Curial liturgy in the early 13th c.--had also looked into the possibility of eliminating these Signs of the Cross but stopped short of doing so. The major objections to the Signs of the Cross in the Canon with which I am familiar have to do with the repetitiveness and also the fact that something that is already consecrated should not be blessed again. St. Thomas, however, has a much different take on this. Berger quotes him at length. I shall use the same quote but taken from the New Advent version. "The priest, in celebrating the mass, makes use of the sign of the cross to signify Christ's Passion which was ended upon the cross. Now, Christ's Passion was accomplished in certain stages. First of all there was Christ's betrayal, which was the work of God, of Judas, and of the Jews; and this is signified by the triple sign of the cross at the words, "These gifts, these presents, these holy unspotted sacrifices." Secondly, there was the selling of Christ. Now he was sold to the Priests, to the Scribes, and to the Pharisees: and to signify this the threefold sign of the cross is repeated, at the words, "blessed, enrolled, ratified." Or again, to signify the price for which He was sold, viz. thirty pence. And a double cross is added at the words--"that it may become to us the Body and the Blood," etc., to signify the person of Judas the seller, and of Christ Who was sold. Ninthly, the resurrection on the third day is represented by the three crosses made at the words--"May the peace of the Lord be ever with you." What a beautiful explanation of this! How could a council which is said to have relied so heavily upon St. Thomas Aquinas have missed this? Moreover, this quote from Aquinas seems to serve as a caution regarding any liturgical reform that is undertaken. We modern liturgy geeks like to stand aloft from the outlook we've built for ourselves by reading the work of liturgical scholars--who admittedly have done much good for us--and pass judgment on this or that aspect of the liturgy. But too often the test given is "antiquity," and nothing else. "Later accretion" is an insult, and "Medieval accretion" is a swear word in many circles. As a result of this, I'm afraid much has been taken out of the liturgy that should have been left alone. Perhaps this is because those in charge of such removal did not consider the wider consequences of what they were doing. This is historicism at its worst. Now the reader is probably expecting a rant against the pale-white, stripped down character of the Novus Ordo rubrics. Not this time. I would like instead to plea with those who think it's a good idea to reform aspects of the Traditional Mass. Stop and think about this. Many of these folks, for instance, are in favor of removing the Last Gospel or the Prayers at the Foot of the Altar, or both. But what significance might they have liturgically, theologically, or devotionally? (Ooops, I used the "d" word.) To my mind, these are the questions that should be considered first; historical considerations are secondary, if they should be considerations at all. We should be careful about the liturgical changes we undertake, because none of us--not even all of us put together--is as smart as tradition. Each generation grasps only part of the picture, and what one generation emphasizes might lie unrealized for centuries at a time, until it's rediscovered again. (This is one reason why liturgical actions which were at first practical and only later enjoyed newfound meaning should not be disregarded. How are we to say that the Holy Spirit was not at work in this all along?) If certain elements are missing from the liturgy, however, it becomes more difficult to rediscover lost aspects of tradition. The liturgy is larger than all of us, and we need to keep this in mind when we're tempted to take a pair of scissors to the Roman Missal. If you're like me, no doubt you've found yourself lying awake at night thinking, "Self, what Chicago needs is an authentic Roman Baroque church." If so, never fear--and the folks to bring it to you are our pals at the Institute of Christ the King. (If they can't pull this off, nobody can.) I suppose most of you are vaguely aware of their continuing renovation project in Chicago's fire-gutted church formerly known as St. Gelasius (now the Shrine of Christ the King), but what you don't know is they now have a website for it, as well as an official project architect, William Heyer, a welcome addition to the growing family of today's liturgical architects. Even better, I've discovered their high altar will be modelled on that of one of my favorite churches in Rome, Santa Maria in Campitelli, a splendid sunburst that will no doubt be a fitting culmination to the renovated shrine. 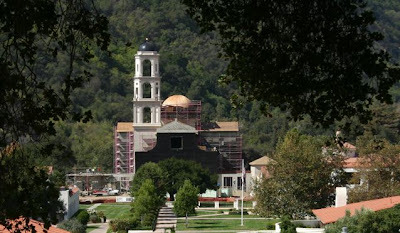 I was recently sent some sneak peak photos of the progress of Duncan Stroik's chapel of Our Lady of the Most Holy Trinity out in Santa Paula, California. Enjoy! For more info on the project and beaucorp renderings, check out Duncan Stroik's website. I'm pleased to present to you, courtesy of the Church Music Association of America, what many consider to be the finest single book on the problem of liturgical transformation and transition between the old and new forms of the Roman Rite. It is Laszlo Dobszay's The Bugnini-Liturgy and the Reform of the Reform. This was published in 2003, and full anticipates the present moment. To pre-answer the inevitable question: yes, a new print edition is coming. The Roman liturgy in the Native American Missions? I was recently pointed to the following link which caught my interest: The Indian Mass (by which is not meant East Indian, but Native American). When thinking upon the variations found in the liturgical West, we are of course accustomed to thinking of the varying rites distinct from the Roman, and of course the mediaeval uses of the Roman rite -- particularly those found in mediaeval England, such as Hereford, York and Salisbury. We perhaps not so accustomed to think upon the liturgical variations/indults which may have been permitted in the context of mission territories in the Far East or new world, or even Eastern Europe. It's for this reason I thought it might be of interest to share this site which states as its purpose to provide "resources for the study of Catholic liturgies of the Northeastern Indian Missions." Now, it seems worth noting that the source materials for the liturgies that the author quotes seem quite rare, so it is difficult to confirm the information, that we might ourselves dig into the history and summation presented. If any of our readership has any further insight to offer either in concert or in contradiction with what the site presents, I think we would all be most obliged. That caveat aside, we certainly know that there have historically been such precedents as regards the ancient Roman liturgy in its texts and rubrics; indults to the norm. "In the Indian Missions of Northeastern America and Eastern Canada—predominantly those areas first explored and missionized by the French—the Mass had developed along its own distinct lines beginning in the late 1600s. "The first major difference between Mass at these missions and elsewhere was that the missions had a very special and rare permission to use the vernacular instead of Latin for the parts sung by the schola: the ordinaries and the propers. The actual vernacular used, of course, varied by whatever tribe happened to predominate at the mission: at Kahnawake it was Mohawk, at Lorette it was Huron. Less commonly, multiple languages were used, such as at the Lake of Two Mountains (Kanesatake/Oka), where both Mohawk and Algonquin were used liturgically, sometimes even within the same Mass. "The second major difference was in the system of propers. The missions dramatically simplified the complex Latin propers by reducing their number and by simply substituting native-language hymns. The Introit was one of the only propers that was always retained, but typically, the Indian Mass used a very small set of them (anywhere from 2-6) which were repeated throughout the season. The rest of the propers were typically replaced by hymns; so there would be a hymn between the Epistle and Gospel replacing the Gradual and the Alleluia/Tract, a hymn for Offertory, and a hymn for Communion. Some of the liturgies show true Graduals and Alleluias, but this was not the case generally. Most, however, do show true Sequences in the few Masses that call for them." They note however that the Requiem Mass retained all of the Latin propers. It is worth noting that a break down of these general characteristics can be found on the site itself in a handy diagram format. Source: Tsiatak Nihonon8entsiake (1865) for the mission of the Lake of the Two Mountains or Kahnesatake, which used both Mohawk and Algonquin in the liturgy. Again, comments and discussion would be most welcome. A wonderful new issue of Adoremus Bulletin, with fully three articles on chant. This one features a fine interview with Jeffrey Ostrowski on the Chabanel Psalms. Further to the post by Philippe about the IBP ordinations, I thought I would include at least a few select photos here on the NLM for our own direct "records" of the event and since I know having such here has proven popular. I would strongly encourage folks to visit the link Philippe gave which has a number of photographs and in hi resolution. The Institute of the Good Shepherd just published the photographs of the ordinations made by Cardinal Castrillon Hoyos on the 22nd of September, 2007. The site of the Canons of St. John Cantius, Sancta Missa, has some interesting new updates for those learning the usus antiquior, most significantly the Ordo Missae of the Missale Romanum with MP3 Audio recordings of the Latin texts. 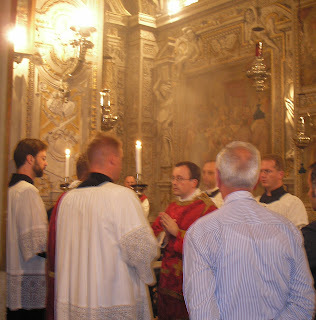 Possibly some of the most pertinent photographs from Sept. 14th must come from, where else, but the FSSP in Rome in their church of San Gregorio. "...the story is current but not yet authenticated ( = a rumor), that again this academic year there will be scheduled a public Dominican rite Mass each week at Rome's Dominican University as there was previously for a time." In the post below about the Westminster Cathedral Choir, some questions and objections were raised regarding both the recording used (it being older and not entirely of Westminster's choir) and also the sound employed by the choir, which one commenter called "shrill." In response to both of those, I offer this recording of a 2006 concert at the Cathedral in St. Paul, MN which was given by this choir. About midway through, Choirmaster Martin Baker explains the Westminster sound, which he calls "full-bodied." He also draws distinctions between Westminster and her Church of England counterparts, which I found interesting. Also worthy of honorable mention is the St. Paul rector's welcome remarks. I found his tour of English Church history to be refreshingly straightforward. Finally, I'd like to call your attention to one of the pieces on this program, James MacMillan's "A New Song," which is in my opinion a masterful union of tradition, innovation, and the Scottish snap. This concert is two hours long, but it's worthy every minute. St. Luke the Evangelist Church (Fairhill Ave. and Easton Road in Glenside, PA) will host a concert of Russian music at 7:30 pm on Saturday, September 29. Con Anima, a vocal ensemble of six singers from St. Petersburg, will perform an hour-long program of Russian Orthodox acapella music and Russian chamber and opera music of the 19th and 20th century. Free will offering. The group will be hosted by parish families for the weekend, then continue it’s East Coast tour, which includes concerts in Boston and New York. There will be a reception following the concert. For more information or directions, visit the web site (www.stlukerc.org). To visit the group's website and hear some samples of the music, go to http://www.con-anima.spb.ru/. First, they report to me that their Sunday, 9:30am Mass (which uses the ancient Roman liturgy) is now a Missa Cantata with full Gregorian propers taken from the Liber Usualis. A rather alarming conversation occurred yesterday morning after Mass, one that underscores the limits of accommodating the aesthetic preferences of the people in the need to call forth participation from them. Well, needless to say, I was dumbfounded. So rather than just get upset, I tried a different approach. By now, the husband was nodding his head vigorously, which gave me encouragement to go on, which I did. By the end of the conversation, they both seemed happy and they thank me for doing the music at Mass that morning, and off they went. I’ve thought a lot about this conversation, because it illustrates a point about the “people.” They are not some amorphous blob that needs to be accommodated in every respect, whose judgment on aesthetics is infallible, whose expectations ought to be catered to in all ways. The people need to have their musical consciences informed by Catholic teaching, just as with doctrine and morals. It would be absurd to say that the morals taught during the homily should be taught in a way that pleases people the most, and that any objection to what is being taught should be a signal that the moral doctrine needs to change. Yes, there is an urgency to teach in a way that reaches people in the most effective way, but that is different from saying that the teaching itself much change. The same is true for liturgy. People need instruction, direction, information, and they need to be given guidance in how to appreciate chant in a way that assists their prayer life and draws them more deeply into the sacraments. Yes, people should be active participants in the liturgy, but not one of their own creation and not one that meets the expectations of the secular world but rather one that offers something completely different. The Una Voce society in Seville, Spain have news about their Mass in the usus antiquior following the motu proprio. The Mass took place in the parish of San Bernardo in Seville, and apparently will be offered there each Sunday morning from henceforth. A news story was featured about them. Fr. 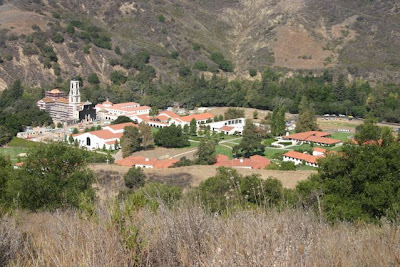 Z reports that "the Pontifical North American College, the seminary where most of the men from the USA live and receive their spiritual formation, is going to be … wait for it… training seminarians to celebrate also using the 1962 Missale Romanum. We will need to see what exactly is going to be done in this regard, of course. But if this actually happens it is a matter of real joy." The above story details news about the implementation of Summorum Pontificum in the Archdiocese of St. Louis. Detailed in this is the quite interesting fact that Archbishop Burke has appointed Father Karl Lenhardt, ICRSS, rector of St. Francis de Sales Oratory in South St. Louis as his delegate for implementing the apostolic letter in the archdiocese. Continuing some further photos from Mass celebrations around September 14th comes these photos, video and music from Lithuania (Parish website) where a priest celebrated the usus antiquior for, he tells me, the very first time in his life, and after 20 years within priesthood. There are some still photos here. On Wednesday, September 26th, at 8:00 pm ET (1:00 am GMT, September 27th) Msgr. R. Michael Schmitz, Vicar General of the Institute of Christ the King, and classical architect William Heyer will be on EWTN Live discussing the restoration of the Shrine of Christ the King Sovereign Priest, a historic landmark entrusted by the Archdiocese of Chicago to the care of the Institute of Christ the King. EWTN , the Global Catholic Network, can be viewed online at www.ewtn.com in streaming video. The impressive church building – currently gutted -- was designed in 1923 by famous Chicago revivalist architect Henry Schlacks. As the thriving “St. Clara Carmelite Church” on the south side, even before its completion in 1927 it already functioned as the National Shrine of St. Therese of Lisieux, and remained such until the mid-1980s. Vicissitudes that affected the neighborhood in the 1970s and 1980s, and a fire that severely damaged the interior of the church were factors that eventually led to the building’s closure and threatened demolition in 2002. However, different advocacy groups from among the neighborhood, the nearby University of Chicago , and a variety of preservationist interests, rose to save the church, and their efforts were successful in securing historic landmark status for the magnificent structure. However, even before the City of Chicago landmarked the former St. Clara (renamed St. Gelasius in 1990), authorities in the Archdiocese of Chicago had already approached the Institute of Christ the King offering them the challenging project of bringing the church back to life, both by re-establishing there a vibrant parish life and restoring the building itself. Exterior repairs have been completed. While the interior is still gutted and in need of completely new mechanicals, the Institute of Christ the King already offers Mass and all the Sacraments in the Classical form of the Latin Rite in a chapel in the adjacent rectory building. The Institute must raise all funds needed to restore this architectural jewel and transform it into a magnificent church where the Classical form of the Latin Rite, and the beauty and depth of Catholic culture and tradition, can be made available to all. For more information, www.institute-christ-king.org/chicago2, or call 773-363-7409. Just a brief check in after safely returning from the Josephinum for the past few days, along with a stop this morning at St. Josaphat's in Detroit which offers the classical liturgy on Sundays at 9:30am. I had the opportunity to meet with a few of our readers at both locations, which was quite enjoyable. I had the great pleasure to meet a handful of seminarians who are at the Josephinum; cordial and gracious hosts all. I want to make a special note of thanks to them, as well as to one other individual who accompanied me on the trip. For the moment, I shall leave it at that as I do intend to write up a report proper on the event, including more on this social aspect as well as the papers delivered. Well, I think it is, anyway. That would be the Westminster Cathedral Choir under the direction of Martin Baker. Here they're singing Josquin and Victoria. If I had the pope's ear, and I most assuredly do not, I'd suggest bringing this choir to Rome to sing for an internationally televised liturgy. Like Christmas or Easter. Question: What Masses require the singing of a choir? Answer: A High Mass is a Mass sung by a priest without the assistance of a deacon and subdeacon. Answer: A Solemn Mass is a Mass sung by a priest with the assistance of a deacon and subdeacon. Question: What is a Pontifical High Mass? Answer: A Pontifical High Mass is sung by a Bishop, with the assistance of a deacon, subdeacon and the other required ministers and the choir. Question: Is the music which the choir expected to sing the same in these Masses? Answer: As far as it concerns the choir, the music that is prescribed to be chanted is the same, with a few distinctions. In a Pontifical Mass, excepting a Pontifical Requiem Mass,the Bishop chants the Pontifical Blessing, to which the choir must sing the responses. Question: What parts of the High Mass are to be sung by the choir? In what language is the choir expected to sing the parts of the High Mass? The Archbishop of Paris made it known, before the 14th of September, that nothing would change in the diocese since a mass had already been granted in 1985 in Saint-Eugène, and two more one week after the episcopal ordinations of Mgr Lefebvre, in Notre-Dame du Lys and Sainte-Odile. According to him this was supposed to meet the needs of the faithful. This was limited to the Mass and did not include sacraments. There was another condition which, even if it is not written is applied in many French dioceses: no priests from the Ecclesia Dei institutes can be tolerated, only diocesan priests celebrating both liturgies. According to them, no special skill is required to celebrate the extraordinary form. On the 14th of September, no sign of joy or thanksgiving in the French dioceses and many restrictive commentaries from the bishops. But a surprise in Paris. The courageous parish priest of Saint-Georges took on his own to announce an evening TLM every Thursday. And he started with an unexpected sung mass on the 14th. In his parish, his predecessors had demolished the liturgical choir, burnt all the vestments and got rid of the candlesticks and so on. Please pray for this priest and his congregation who will certainly not please the archbishop and his strategy. Well, actually for purposes of today's Mass, we were called Cantabo Deo, but "Wynnewood Garage Schola" sounded like a cool headline. Well, maybe not. Here is our Ordo musicae for this Mass, which was celebrated by His Excellency, the Most Rev. Joseph McFadden, auxiliary bishop of the Archdiocese of Philadelphia. This music was well-received by all, including the bishop, who expressed his gratitude both publicly and privately. I might gratefully note that the bishop sang many of his parts as well. This helps to reinforce the idea that music is an integral part of Mass. 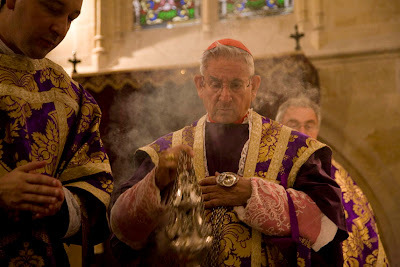 Today, Saturday 22nd of September 2007, Cardinal Castrillon Hoyos was sent by the Pope to ordain five new priests for the Institute of the Good Shepherd in Bordeaux, France. The ordination took place in Saint-Eloi, the historical church which had been restored by Father Laguérie, Superior General, at 9:30 AM. Cardinal Ricard, President of the French Episcopal Conference of bishops and Archbishop of Bordeaux attended. 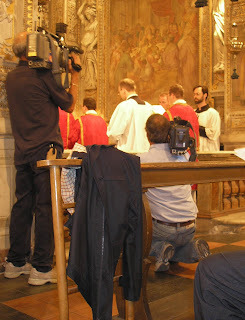 Cardinal Ricard has been openly criticized by some parish priests for being present in such a ceremony as can be seen on the French TV. We will probably get more photographs in a near future. Every now and then the parish musician or pastor is bound to be queried about the possibility of using recorded music in a liturgical service. In my experience, this is not allowed in most places, and at the same time it seems to be a subject that confuses a lot of people, including some who make or enforce the rules. It seems like a lot of people feel silly keeping this rule. Some years ago I was worrying aloud to one of my college professors that recorded music from synthesizers, computer music, etc., could come along and put us all out of work. My teacher had a bit more equilibrium about the whole thing. He said that it was quite likely in his opinion that there would always be a demand on the part of audiences to see musicians making music with their bodies. Bodies making music. I had never thought of this before. In hindsight it makes obvious perfect sense, and it's why singing is most highly valued by the Church. In fact, one would say that the principal bodily mechanism for making music, in many cases, is the breath, which recalls God's breathing life into Adam and the Spirit hovering over the waters and bringing order out of chaos. The breath is a creative force. Moreover, in almost every great musician I've rubbed elbows with, I've noticed that they are completely comfortable in their bodies; there is no awkwardness or clumsiness whatsoever. The Psalmist talks about offering up a sacrifice of jubilation, and indeed, the singing at Mass is a sacrifice, as the whole Mass is a sacrifice, from start to finish. Moreover, St. Paul discusses the offering of our bodies as a living sacrifice. It seems to me that in order for our music in the liturgy to be a sacrifice, we must be using our bodies, and not just pressing Play on a remote control. Only then will the music reach its full potential to unite our hearts and minds to the mystery of the altar; only when we have given something away will a full return be granted back to us. So don't feel silly about banning recorded music. Explain to the faithful the sacrifice of jubilation, and the importance of making a musical sacrifice with our bodies. Might this kind of catechesis go a long way toward diminishing the concept of liturgical music as "performance" or "entertainment?" Might it also mitigate the puritanism which shies away from "art music" (which in the minds of many encapsulates everything from chant to Arvo Part), thinking it's unfit for worship, when it is often the greatest musical treasure that can be offered to the Almighty? Is this concept of sacred music as a sacrifice the paradigm through which it might best be reformed? I wish to extend thanks to all of you who in any way--most particularly through prayer--helped us to get the Schola Gregoriana Philadelphia off the ground. We have completed our four preliminary rehearsals and have made the selections for the core schola which will now be the permanent group. What we've ended up with, ultimately, is a men's schola that, for the time being, at least, will focus on the chant repertoire. These men are solid and they've all seemed to absorbed that wonderful Solesmes chant sound. We are ready to field at least a few requests to sing in parishes. We'd like to keep this mostly to Catholic parishes within a reasonable distance of Philadelphia. While we can't exactly start out with an intense schedule, I think we will want to get started sooner rather than later, so drop me a line. If you are a pastor or a music director who would like us to come sing chant in your parish, please contact me at hocket [at] gmail [dot] com. Here is an online missal, older form. It is not bookmarked. Is someone up to bookmarking it and sending it back so we can post it? Mail me here. You probably know the two important pilgrimages which take place on the week-end of Pentecost: Paris - Chartres, and Chartres - Paris, both of them using exclusively the usus antiquior. There is a bigger and older pilgrimage in France, actually the biggest one. It takes place every year on the 15th of August in Lourdes. It is not a 105 km walk, but it is more focused on sick persons and their families, friends, and volunteers. It is called the "Pèlerinage National", or more simply "Le National". The pilgrimage was founded in 1873 by by Assumptionist Fathers: 492 pilgrims at the first pilgrimage. Today nearly 50 000 pilgrims attend this event every year. My purpose is not to describe this pilgrimage but to show that things are changing slowly in France, regardind the communities of faithfull or priests who dedicate themselves to the extraordinary form of the roman rite. I did not personally attend but I was sent (recently) some photographs that I would like to share with you, and some comments from Father Bizard, FSSP, and Father Pozzetto, FSSP and chaplain to the Chartres Pilgrimage. Summorum Pontificum was not yet published but the times when the usus antiquior was nearly banished seem to be over. The pilgrimage was spread over five days, and every day three masses have been celebrated in the basilica (which is not the biggest sanctuary but the oldest and I think much more beautiful than the very modern crypt). Low mass at 6:15 AM, sung masses at 9:30 AM and 6:30 PM. Many people attended, most of them used to this form, some discovering it. Since the motu proprio, the 9:30 mass will be celebrated by the chaplains of the sanctuary every Sunday and day of obligation. It is clear that now there is a great welcome from the authorities of the sanctuary: everything to say mass had been prepared in advance in the sacristy. To give an idea of the congregation, there were 600 people attending the 9:30 mass on Assumption Day and the crypt of the basilica was full as well for the evening mass. Three priests were present for confessions during the office. Communion given by several priests. The ICKSP priest wears a blue camail. The congregation, view from the organ loft. Lourdes famous way of the cross. Some officials, among them Fr Barker, Fr Després, Fr Pozzetto, Fr Bizard.